This oldie is based on Tchaikovsky’s “Melody No. 3, Op. 42”. 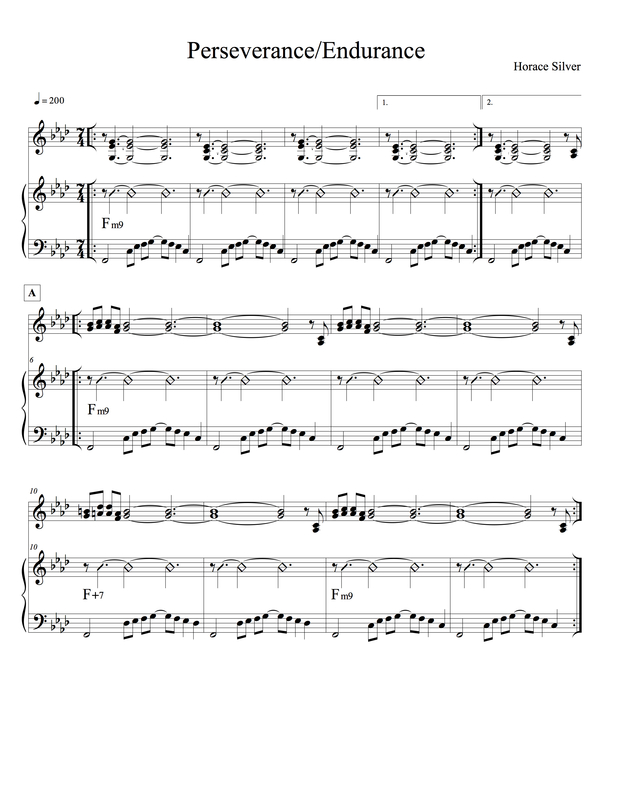 This entry was posted in Uncategorized and tagged jazz, lead sheet, music, Noteheads, Tchaikovsky, These Are The Things I Love, transcription on April 25, 2015 by noteheads. This entry was posted in Uncategorized and tagged jazz, kenny barron, lead sheet, Marie Laveau, music, Noteheads, transcription on April 18, 2015 by noteheads. Horace Silver wrote some of the most memorable hard bop standards of the 50s and 60s. He continued to compose prolifically in the 70s and 80s, but his albums from this period are for some reason not as well known. This funky 7/4 tune is from Silver ‘n Wood, and is the fourth and last movement of Horace’s “Tranquilizer Suite”. This entry was posted in Uncategorized and tagged Endurance, Horace Silver, jazz, lead sheet, music, Noteheads, Perseverance, transcription on April 11, 2015 by noteheads. 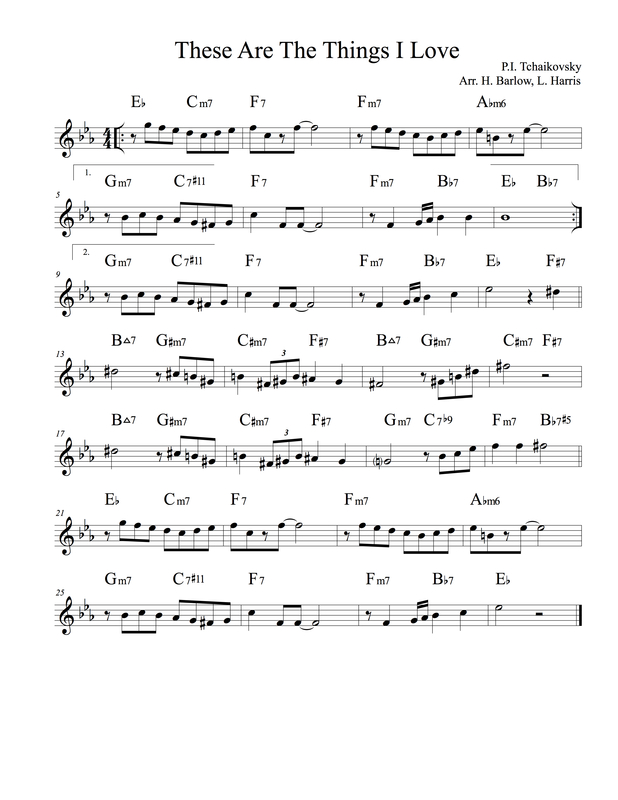 There are dozens of jazz heads based on the chord changes to Gershwin’s “I Got Rhythm”, which makes it probably the most popular standard template after the 12-bar blues. 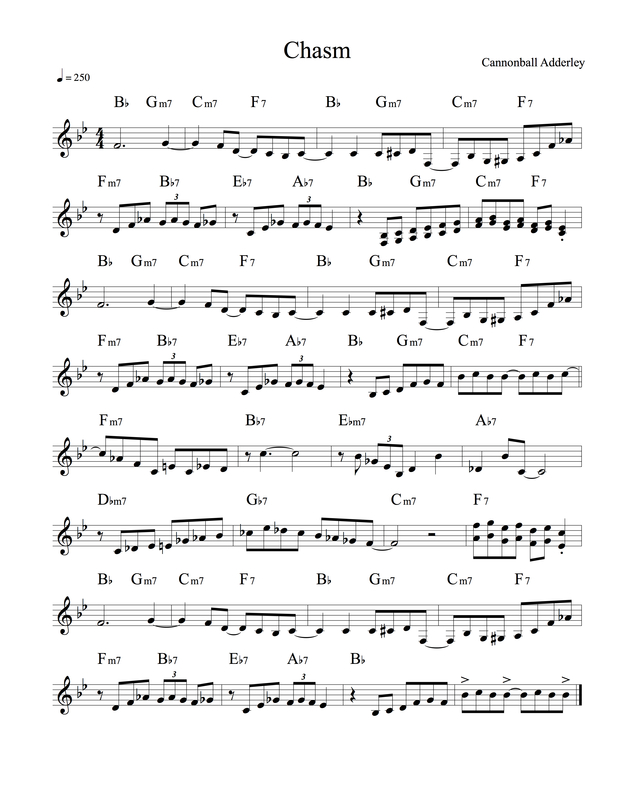 Unlike the blues, though, almost every version of “rhythm changes” is in the same key. Usually the difference in these tunes lies in the B section, as can be seen in this Cannonball Adderley composition, where he replaces the usual D7 / G7 / C7 / F7 with a Bb7 / Ab7 / Gb7 / F7 progression (with attendant subdominants). 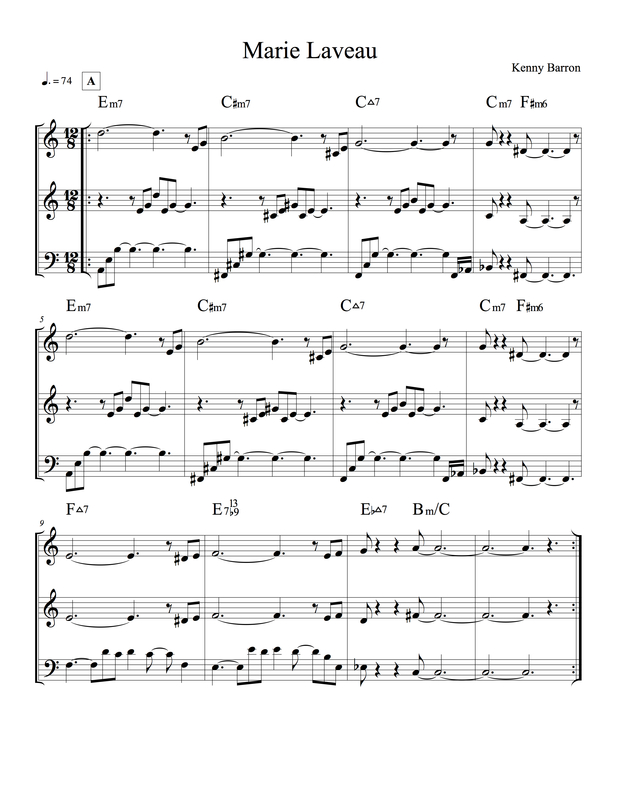 This entry was posted in Uncategorized and tagged Cannonball Adderley, Chasm, jazz, lead sheet, music, Noteheads, transcription on April 5, 2015 by noteheads.